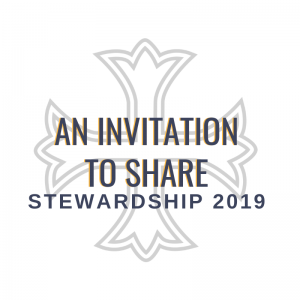 This Sunday, we are kicking off our 2019 Stewardship Campaign – An Invitation to Share with a parish-wide event. The stewardship commission invites everyone to a church family conversation about money and faith. Children, youth, and adults will get to know each other as well as share thoughts about ways we spend, save, and share money. We will then learn more about how St. George’s spends, saves, and shares our monetary gifts as we do God’s work together. Join us at 10 a.m. in Sydnor Hall for some time well spent!